A new species of Phalaenopsis Orchid (Orchidaceae: Vandeae, Aeridinae) has been discovered, based on study by Destario Metusala and Peter O’Byrne. The orchid was obtained from Kapuas Hulu, West Kalimantan Province, Indonesia. Description of morphological data is based on observations on living plants, wet preserved material, herbarium specimens, and color photographs from cultivated individu. Comparison of morphology with other related Phalaenopsis species (P. gigantea, P. doweryensis, and P. rundumensis) are carried out based on data from protologists, living plants, specimens herbarium and photographs. The results of the study indicate that there are significant differences in the morphological character of the flower, so the Phalaenopsis sp specimens from Kapuas Hulu are described as new species with name of Phalaenopsis kapuasensis Metusala & P.O'Byrne. Phalaenopsis kapuasensis Metusala & P.O'Byrne belongs in the same complex as P. gigantea J.J.Sm., P. doweryensis Garay & Christenson, and P. rundumensis P.J. Cribb & A. Lamb. All these species are endemic to Borneo. Phalaenopsis gigantea was described in 1909 from specimens collected on the 1896-1897 Nieuwenhuis trans-Borneo expedition, and cultivated at Bogor (Smith, 1909). It has been recorded from Kalimantan, Sabah and Sarawak in lowland dipterocarp forest, hill dipterocarp forest and mossy hill forest from sea level to 900 m. Flower colour is somewhat variable, and two colour forms have been formally described. Although the species is well-known in cultivation, the majority of specimens are ex-nursery, and there are surprisingly few documented records of wild-collected plants. Consequently, details of range, habitat and infra-specific variation of the wild population are poorly understood. Phalaenopsis doweryensis was described in 2001 from plants cultivated in the USA that reportedly originated in Sabah (Christenson, 2001). The researcher have seen all the material originated in nurseries; the range, habitat and infraspecific variation of the wild population are unknown. On-line photographs show some variation in flower colour, especially the colour and amount of spots/streaks on the tepals. One or two of these photos appear to show P. kapuasensis rather than P. doweryensis. Phalaenopsis rundumensis was described in 2011 from plants collected at 600-800 m in hill forest in the Rundum area of Sabah, and cultivated at Tenom Orchid Centre (Cribb & Lamb, 2012). unknown. In their protologue, Cribb & Lamb implied that P. rundumensis may be intermediate between P. gigantea and P. doweryensis, and stated that the exact relationship of P. rundumensis to P. gigantea needs further investigation. Kipandi Park in Sabah has two Phalaenopsis specimens that were purchased from a local orchid hunter, who collected them from a single locality. Both have the habit and tepal shape of P. rundumensis. Both have an inflorescence that elongates slowly, producing 2-3 flowers at a time, which is a characteristic of P. rundumensis. The 5.8 cm high flowers on one plant have an elliptic lip midlobe with the lateral margins in the middle slightly erose, and towards the apex somewhat expanded and dentate; this is typical of P. rundumensis. The other has smaller flowers (4.8 cm high) with an obovate midlobe that has lateral margins towards the apex considerably expanded and deeply dentate, which is closer to P. doweryensis than P. rundumensis. The Researcher are still far from understanding the taxa in this complex. Unfortunately, most newly-collected specimens are sold to nurseries or private individuals rather than being donated to botanic gardens or placed in herbaria, so the information needed to resolve the complex is being lost to science. Although we are reluctant to add to the confusion surrounding this complex, the presence of a distinct taxon needs documenting. Since P. kapuasensis is as distinct from the other species as they are from each other, we have opted to describe it as a species rather assign it subspecific status under one of the other taxa. In 2011, the first first researcher saw a picture of a strange wild-collected Phalaenopsis labeled as Phalaenopsis gigantea ‘yellow’ from West Kalimantan, and asked the owner of the plant, Muhammad Gunawan, to send some flowers for examination. Muhammad Gunawan kindly supplied some flowers (as spirit material) in mid 2011. The first author initially thought this material represented a form of Phalaenopsis gigantea with narrower tepals, a presumption that was supported by the lip midlobe shape, which is quite similar to that of P. gigantea. exhibition held in Jakarta in 2017. 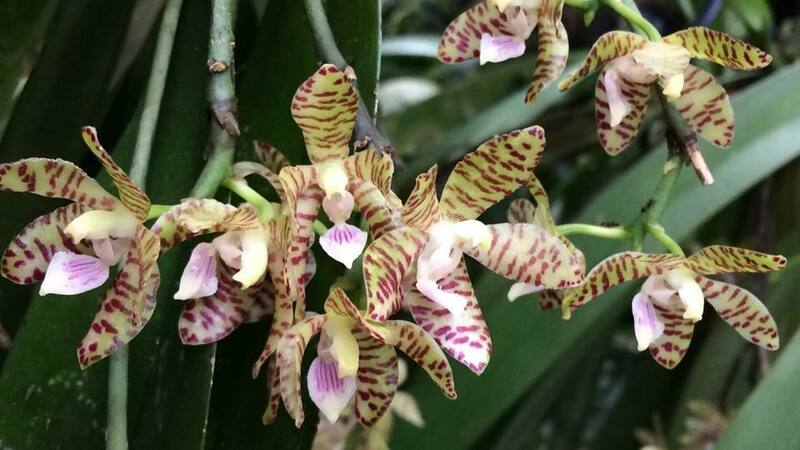 In mid 2017, Dr. Ingrid Hilman, one of the orchid hobbyists who has the plant, kindly gave the first author some fresh flowers, and the researchers were able to re-examine its status. Regency, RIO 9005 (holotype: BO!). Diagnosis:—Phalaenopsis kapuasensis is close to Phalaenopsis rundumensis but differs in having shorter tepals not more than 17 mm long, a lip with a hairy midlobe and different shape sidelobes. Pendent epiphytic herb. Roots cylindrical to slightly flattened when creeping, greensilvery, textured on surface. Stem 4-5 cm long. Leaves usually 3-6 per stem, pendent, oblong to oblong-elliptic, 22-48 × 5-10 cm, succulent, thick, waxy, obtuse to unequally retuse, green;, not compressed, green. below the rachis, light green to dark green, bearing up to 30 flowers (or more) with 2- 10 open simultaneously; floral bract triangular, 2.5-3.0 × 3.0 mm, acute, green. Flower 2.6-3.0 cm across, rather flat and somewhat stellate; sepals and petals greenish-yellow to pale-yellow with continuous or discontinuous brown or maroon-red transverse bars; lip white, midlobe with longitudinal purple lines on upper surface, stained pink below, sidelobe interior often suffused, spotted or streaked purple, basal swelling yellow or gold; column and anther-cap white to cream. Column porrect, slightly decurved near the apex, 7.0-7.5 mm, from a narrow base broadening to 3.5 mm before apex, shortly pubescent on ventral surface; anther cap sub-globose with two triangular plate-like projections on the front, 2.5 x 3 mm, apex obtuse; pollinia 2 with a cleft, sub-globose, 1.5 x 1 mm; stipe 2 mm, narrow and curved. Distribution: Indonesia, West Kalimantan (exact locality withheld for conservation reasons). Habitat and ecology: Lowland forest; 50- 200 m.
Etymology: Named after Kapuas Hulu Regency, the area where the type material originated. Phenology: January, May, July, August, September. inflorescence has all the flowers open at the same time. Phalaenopsis gigantea has larger (45-50 mm wide) flowers with relatively broader tepals that usually overlap. In P. gigantea the midlobe shape is too variable to use in diagnosis, but it never has hairs on the upper surface. flowers open at a time. Phalaenopsis kapuasensis has flowers of similar size to P. doweryensis, but differs in having a midlobe without extension on the upper lateral margins. Phalaenopsis doweryensis has a midlobe with the lateral margins at the front extended into conspicuous minutely lacerate-dentate hooks, and it lacks hairs on the upper surface. Phalaenopsis kapuasensis differs from P. rundumensis in having smaller flowers (26-30 mm wide) with oblong sidelobes that are distinctly notched on the rather broad upper margin and a midlobe that is hairy on the upper surface. By contrast, P. rundumensis has larger flowers (45-50 mm), the sidelobes are triangular with a narrow entire upper margin, and the midlobe is hairless with slightly papillose lateral margins. Since the midlobe shape is variable in P. kapuasensis and P. gigantea, and the variation is unknown in P. rundumensis (see Introduction), that character should not be used as a diagnostic character for species in this complex.